The Hollywood Burbank Airport, also known as the Burbank Bob Hope Airport, is the closest airport to Hollywood and central Los Angeles and is one of six major airports in the area. Our Hollywood Burbank Airport guide includes information on terminal facilities, public transport access and accommodation options nearby. An information desk (tel: +1 818 840 8840) is centrally located in Terminal A. Courtesy telephones are available throughout the terminals. Hollywood Burbank Airport is located on Hollywood Way, which can be accessed via the Golden State Freeway (Interstate 5). From Hollywood and central Los Angeles, take Hollywood Highway-101 northbound, which leads onto Hollywood Highway-170. Turn eastbound onto Victory Boulevard and then northbound onto Hollywood Way. The journey time from central Los Angeles is approximately 30 minutes. Terminals A and B are housed in the same building and are within easy walking distance of each other. Hollywood Burbank Airport is located 5km (3 miles) northwest of Burbank and 20km (12 miles) north of Los Angeles. Bus: Local bus routes are served by Metro (tel: +1 323 466 3876; www.metro.net) and Burbank Bus (tel: +1 818 246 4258; www.burbankbus.org). Metro routes 94 and 794 link to central Los Angeles, while bus 222 operates to Hollywood. Burbank Bus' 'Empire to Downtown' route also links to the city centre. Free shuttles from the airport to the Downtown Burbank Metrolink station are also available. Taxi:Taxis and shuttles are available from the airport, departing from the islands in front of the terminal building. The fare into Burbank is around US$10, and US$40 to central Los Angeles. Expect a journey time of 30-40 minutes to Burbank, but this may be longer depending on traffic conditions. Rail: Local Metrolink (tel: +1 800 371 5465; www.metrolinktrains.com) and Amtrak (tel: +1 800 872 7245; www.amtrak.com) commuter trains serve the airport station on Empire Avenue near the south entrance to the airport. The station is within walking distance, and an airport shuttle operates to/from the terminals. Metrolink services run regularly (Monday to Friday only) to Los Angeles Union Station and other destinations, while the Amtrak Pacific Surfliner train travels between San Diego and San Luis Obispo, stopping at Hollywood Burbank Airport. The journey time into central Los Angeles is 25-30 minutes. A bank is situated at the main entrance on Hollywood Boulevard, near economy car park C. There are ATMs located around the terminals. There are several places to eat in both terminals. These include a burger outlet and café in Terminal A, a restaurant in Terminal B and bars in each terminal. There are various newsagents within the terminal, some of which sell gifts and souvenirs. Duty-free shopping is not available, as the airport only serves domestic routes. Skycap porters are available at the airport to help with luggage. A dedicated lost and found service (tel: +1 818 729 2231) is operated by the airport police. There are shoeshine services within the terminals. The nearby Los Angeles Marriott Burbank Airport hotel (tel: +1 818 843 6000; www.marriott.com) and the Hilton Los Angeles North/Glendale (tel: +1 818 956 5466; www3.hilton.com) offer extensive business and conference facilities. 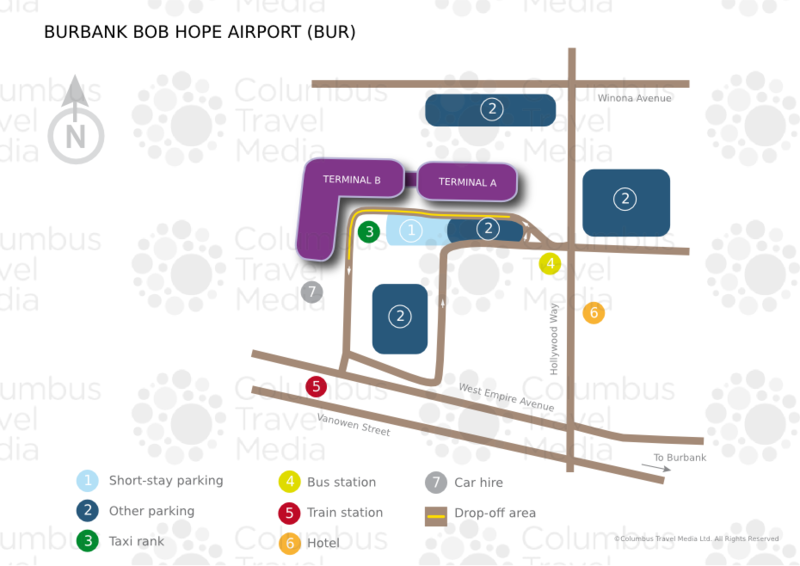 Free Wi-Fi internet access and public telephones are available throughout Burbank Bobe Hope Airport. Services for the disabled include TDD phones located at gates A1, A6, B3 and in the Terminal B lobby. Lifts are available to board aircrafts, and wheelchair accessible shuttles link the long-term car parks within the terminal. Short-term parking is available at a four-storey car park opposite the main terminal: all vehicles entering short-term and valet parking are subject to a search. Long-term parking is available at economy car parks A, B, C and E and there is a free shuttle between the economy car parks and the terminal building. Valet parking (tel: +1 866 727 5287) is available from directly in front of the main terminal entrance. Car hire desks are located in the Terminal B baggage reclaim area. Alamo, Avis, Hertz and National are all on-site. Budget, Dollar, Enterprise, Thrifty and others are located off-site and can be reached by shuttle minibuses, which are available via courtesy telephones located in both baggage reclaim areas.